John's Labour blog: Molins to Workforce: give up your pension...or else! Bad taste photo accompanying this post. 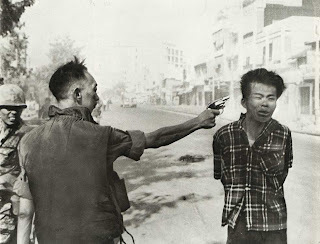 For those who don't know it, it shows a Saigon police chief shooting a Vietcong fighter in the head at point-blank range. It won a Pulitzer prize for the photographer in 1969 and did much to change the American public's attitude towards the war in Vietnam. To use it to illustrate a story about workers being forced to leave a pension scheme - however bad that is - trivialises what the Vietnamese people went through. It does you no credit John and you should remove it. I did think beforehand about the ethics of using this photo and again with reference to your comments. But no, on balance I do not agree with you and I do not think that it trivialises what the Vietnamese people went through at all. In fact it brings the experience to a wider audience. The picture is an iconic picture which I think helps illustrates and captures the awful predicament of those workers in Molins who face possible poverty and misery in retirement - or being sacked. Most of them have spent all their life working for Molins and fear their futures. This is not only disgraceful company behaviour but also probably illegal under employment law and also possibly a criminal act under pension consultation regulations. I was going to title the photo post as "the CEO of Molins negotiates with his staff". Does this compare to the suffering of the Vietnamese people? No, but I don’t think that the post (as opposed to the use of the photo) says that. I think you made a bad decision. If you genuinely think the photo captures the predicament of Molins workers then what must you think of the fate of perhaps 5 million Vietnamese dead? As for bringing the experience of the Vietnamese to a wider audience; really? Come on, be serious. Using this photo makes what would otherwise be a good post, with an important point, seem absurd. Well, that is your view but it isn't mine. I am glad that you think the post is important. I have added your Blog to the list that I am following. I found your post on Molins to be very informative. The question remains why didn't the Company take a loan from the Fund. This did not become illegal until 1997 ? Crikey, I didn't even realise that they could get loans from the fund before 1997! I would think that companies would perfer the cash without strings rather than any loan liability.